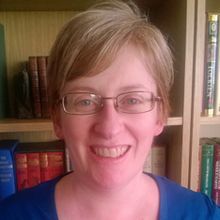 Dr Una McCormack (born 1972) is a British-Irish academic and novelist. McCormack teaches at Anglia Ruskin University, as a lecturer in creative writing. She is also a co-director of the Anglia Ruskin University Centre for Science Fiction and Fantasy. She is best known as the author of numerous tie-in novels based on the science fiction TV series Star Trek and Doctor Who. McCormack was born on 13 January 1972 in St Helens, Merseyside. She is the youngest of six children born to Gerald James McCormack and Kathleen McCormack (née Towey), both primary school teachers. She was educated at Carmel College, St Helens, then studied for a BA in History and Social and Political Science at Newnham College, Cambridge, followed by an MSc in Psychology at the University of Reading and a PhD in Sociology at the University of Surrey. McCormack's first professionally published fiction was a short story, "A Time and a Place", published in issue 197 of Doctor Who Magazine in 1993. Her fan fiction based on the television series Star Trek: Deep Space Nine led to her being commissioned to write a story, "Face Value", for the Prophet and Change anthology collection published by Pocket Books in 2003. Her first DS9 novel, Cardassia: The Lotus Flower, was published in 2004. This was followed by four more Star Trek novels: The Never-Ending Sacrifice (2009), Brinkmanship (2012), the New York Times bestselling The Fall: The Crimson Shadow (2013) and The Missing (2014). Her latest DS9 novel, Enigma Tales, was published in 2017. She has written four Doctor Who novels for the official New Series Adventures range published by BBC Books: The King's Dragon (2010), The Way Through the Woods (2011), Royal Blood (2015) and Molten Heart (2018). McCormack has also written numerous audio dramas based on Doctor Who and Blake's 7 for Big Finish Productions. She is the author of The Baba Yaga (2015) and The Star of the Sea (2016), two books in the Weird Space series from UK science fiction publisher Abaddon Books. McCormack has also written The Undefeated, a work of original fiction, which will publish in May 2019. McCormack lives in Cambridge with her partner Matthew and their daughter. ^ "Authors : McCormack, Una : SFE : Science Fiction Encyclopedia". Retrieved 8 March 2017. ^ a b "Dr Una McCormack - Anglia Ruskin University". Retrieved 8 March 2017. ^ Una McCormack (September–October 2016). "All True, Especially the Lies—Or, How I Learned to Stop Worrying and Love Cardassia". Uncanny Magazine. No. 12. pp. 83–. GGKEY:XDTZ0NNWZUY. ^ "Una McCormack, Official Publisher Page, Simon & Schuster UK". Retrieved 8 March 2017. ^ "Doctor Who: The King's Dragon". www.penguin.co.uk. Retrieved 17 December 2018. ^ "Doctor Who: The Way Through the Woods". Amazon. 28 April 2011. Retrieved 17 December 2018. ^ "Doctor Who: Royal Blood". www.penguin.co.uk. Retrieved 17 December 2018. ^ "Doctor Who: Molten Heart". www.penguin.co.uk. Retrieved 17 December 2018. This page was last edited on 8 April 2019, at 14:53 (UTC).